I’m happy to announce the release of the Marked Birds Database version 2.2.0. It contains 6 new features and improvements, as well as some fixes. Images: exporting all images. 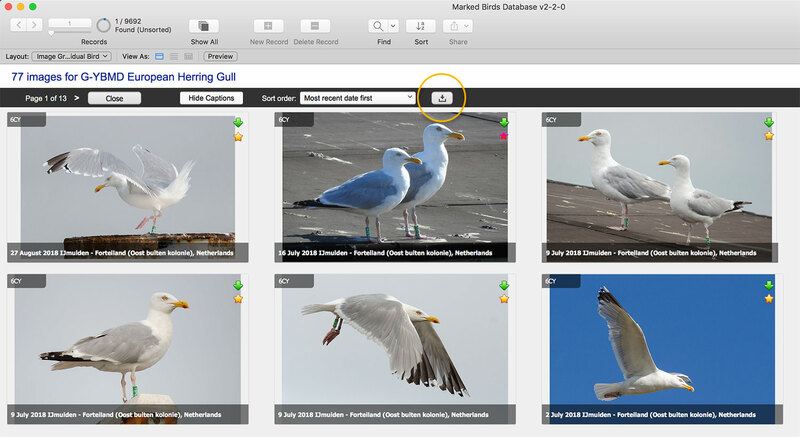 It is now possible to export all images for a bird or all images for an observation in one action. For birds, go to Main menu > Images and click the download button. For observations, go to Observation Details and click the download button. You will be asked to choose a folder in which to download all images. After confirming the location, all images are automatically downloaded. Images: indicator which image is set as the standard image. For each bird it is possible to set one image as a standard image: the image that represents that bird. When viewing images (either in Observation Details or in the Image grid for a bird), the image that is set as the Standard image is now indicated by a purple icon to distinguish it from all other images. Year indicators in observations list in Bird Overview: On the Bird Overview screen, each first observation of a calendar year is now indicated. This makes it easier to scan lists of observations, especially when many or all observations are done on the same location. 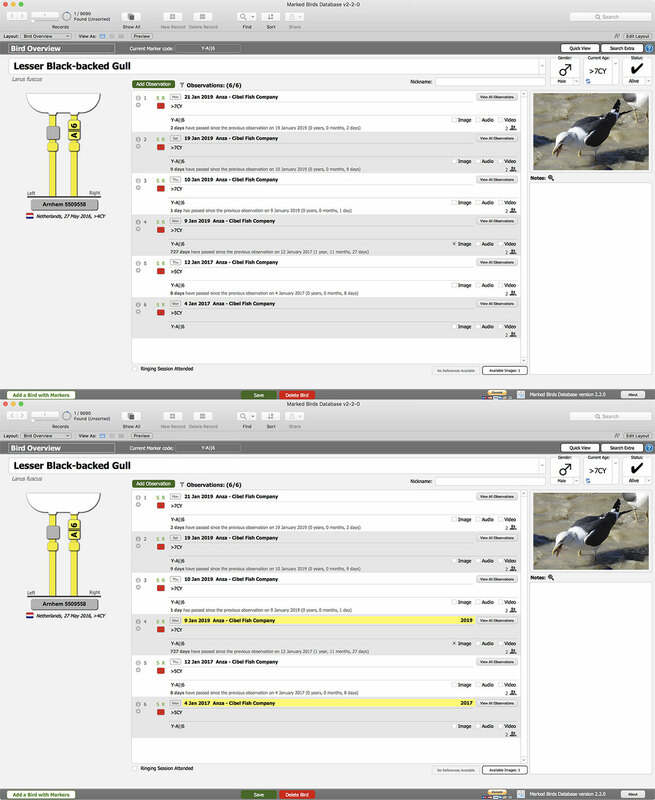 In the following image, the top image shows the Bird Overview without the indicators while the bottom image shows the same bird but now with year indicators (click for larger view). Note that the indicators only appear when observations exist over multiple years; when all observations for the bird are of the same year, the indicator does not appear. BirdRing import: choosing a date from the CSV file. When importing a CSV file, it is possible to choose which date(s) from the file should be processed. One option was to choose a date from a calendar. However, this could result in picking a date which was not available in the file. BirdRing import: seeing which location details have been replaced. One of the options in the BirdRing import is to quickly change the location details for multiple observations in one (batch) action. While doing this, it is now indicated for which observations this has been done. An option to restore the original location details has also been added. System: automatically zooming out on small screens. The Preferences already had an option to automatically zoom out when the database is started to make sure that the layout fits on small screens. To control on which screen sizes this should occur, the screen width can now be set. When the width of the screen is below this width, the action is triggered (when the feature is enabled). The feature is enabled by default and it can be disabled via Manage MBDB > Preferences > System > Zoom out on startup. MBDB-144 Add an option to export all images for an observation. MBDB-659 Observations printout: Show standard bird image. MBDB-906 Add Event To Marker: incorrect Notes field is used. MBDB-1071 Add indicator to show that an image is set as the standard image for a bird. MBDB-1094 BirdRing import – Exclude birds based on observation date: show dates that are in file. 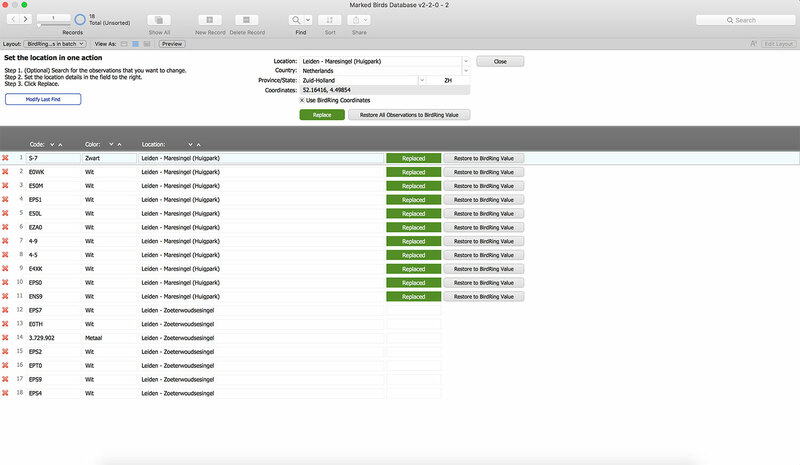 MBDB-1104 BirdRing import: Set location in batch – add option for restoring changed values. 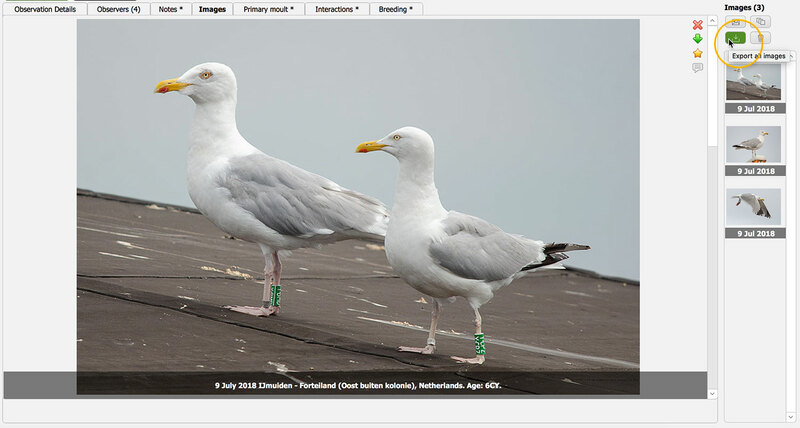 MBDB-1105 BirdRing import: Set location in batch – make it better visible which observations have been processed. MBDB-1106 Marker Events: Use Event for all Markers: show warning when some fields are empty. MBDB-1108 Adding image: reduce steps for loading Bird Overview layout. MBDB-1109 Batch update observers in Observation Details results in empty row. MBDB-1110 Bird Overview: better visualize first observation of each calendar year. MBDB-1111 Current Marker Code text color ‘green’ is not displayed. MBDB-1112 BirdRing import – Bird species not recognized when species code does not fully match (missing starting zero). MBDB-1113 BirdRing import – ‘Record could not be modified’ error when setting Visual Display. MBDB-1114 Euring species age: update to Euring Exchange Code V117 – January 2018. MBDB-1115 After removing an observer/ringer, the observer/ringer still exists. MBDB-1117 Incorrect number of images shown in Observation details. MBDB-1119 Adding bird using Standard form: metal ring is added with red background color. MBDB-1126 Automatically set zoom level for layouts.